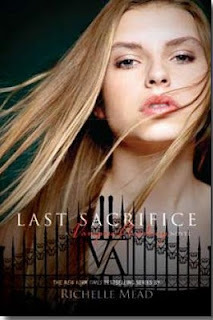 I've been waiting for the conclusion to the Vampire Academy series for almost two years now, and Last Sacrifice was definitely worth the wait! This review is spoiler free---I will come back later and write about spoilers upon request. Richelle Mead has written the perfect end to an excellent series. I think that Vampire Academy is my favorite series of all time. I'm just going to come right out and say it: I was worried we would get a sad, Mockingjay-type book, full of war, death, disillusionment and betrayal. I knew I couldn't take that level of disappointment with the characters I have grown to love so much. Richelle Mead has proved herself a true romantic and Last Sacrifice gave me everything I was hoping for. She answered all the lingering questions I had and wrapped up the story so brilliantly, not with a too-perfect Twilight-esque ending but with a realistic conclusion that left me completely satisfied. The plot twists, the pacing, the romance, the love triangle, the multi-layered story: Mead took all of these elements and wound them together to make a book that is truly impossible to put down. I read this entire, 594-page book in one sitting and I would not have had it any other way. There was just no stopping me once I started this thrill ride. Mead made me tear up several times and I outright cried twice. I love it when I'm so wrapped up in a story I feel like I'm right there with the characters! If you have not read this series, I would recommend it to anyone. It's just that good! Usually I love YA for what it is. However, this was the one time I found myself wishing for an adult-level book so that we could get more details on the love triangle. Call me trashy but I wanted more! All of it. I loved all of it. I didn't read, even though there are no spoils. I just scrolled to the bottom to see the five stars. I'll come back and read after I read it. :D Mine is coming in the mail, hopefully today!!! I am dying to dive in. So glad you loved it! One of my reading resolutions is to read this series. It's on my tbr pile for a while and I wanted to wait until all books are out so I can join it in one setting. So glad that you loved it! I hate when good series end on a bad note, which ruins the entire experience. I am so very excited for this one. I was slightly disappointed with the last book but am still foaming at the mouth for this. Hopefully I'll get it soon. Not trashy at all I would have loved a few more steamy details. But I agree- wonderful ending to wonderful story. I wouldn't mind talking spoilers in a later post or emails. Great review!! I have been debating whether or not to read this one and you have convinced me to read this series, especially since I love romance!!! Thanks for posting!! Yours is the first review I've read for Last Sacrifice. Ahhh, I have to wait to get my hands on a copy because instead of studying for my exams, I know I'll be reading Last Sacrifice! I so agree with you about more info on the love triangle! It was what kept me reading the books (along with the everything else, but it was key!). A fab-o end to a wicked series! OH MY GOODNESS! This book took my breathe away from beginning to end! Richelle Mead truly has a gift for storytelling! The character growth continued until the last page!!! I'm debating on this book, she is coming to Dallas next week so I may try to read it. You, wanting more *naughty* details? LOL I'm glad you were finally able to read this book. I know how anxious you were. I cannot wait to start VA.
i thought the ending wasnt as good as a hoped. i feel like the ending was very rushed believe it or not. im not going to give it away but she didnt go into detail about what happened between sydney and abe (why sydney was so willing to help rose), about the love triangle, i feel like there should have more happening at the end. And what about jill and her life? also i hated what happened between lissa and rose at the end and how **** was gone, very dissapionted, i wish there was another one coming out cause i feel like this is not the way it should have ended. there was not enough detail in it.... but i still loved the series.